Right. Month of self-imposed blogging exile over. I’ve not been entirely idle; in fact I’ve been making waves over at Kasterborous this week, complaining about the slapping in Doctor Who – a point of view which has caused much ire among a community that is getting hot under the collar about a supposed overreaction, while still avoiding the issue. Anyway. What were we doing in Aylesbury? Well, the two eldest had gone horse riding – one of these summer activity things – which left us with time to kill and a museum to visit. 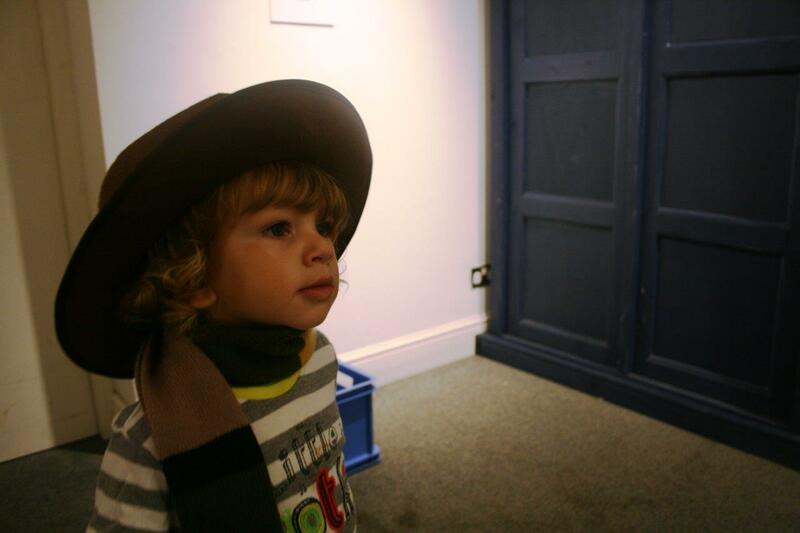 Said museum is the Buckinghamshire County Museum, an interesting collection of artifacts and hands-on activities. (A word of advice: this is not in the County Hall, and do not ask anyone in the County Hall for directions; they are useless.) There is a mock-up Tudor house, a fairly impressive taxidermy collection and a wall-sized photo of a man with a nose piercing that freaked out Daniel, to the extent that he had to enter the room backwards in order to avoid its gaze. 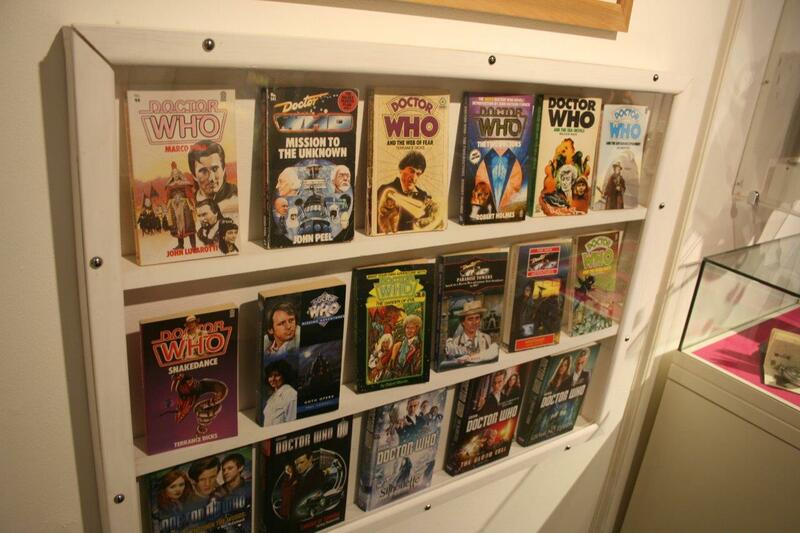 There is also – at least for the next few weeks – a pop-up Doctor Who exhibition, consisting of fan-donated memorabilia. The room in which it is housed is reasonably sized and the collection – while understandably not exactly vast – is free to view and refreshingly eclectic. 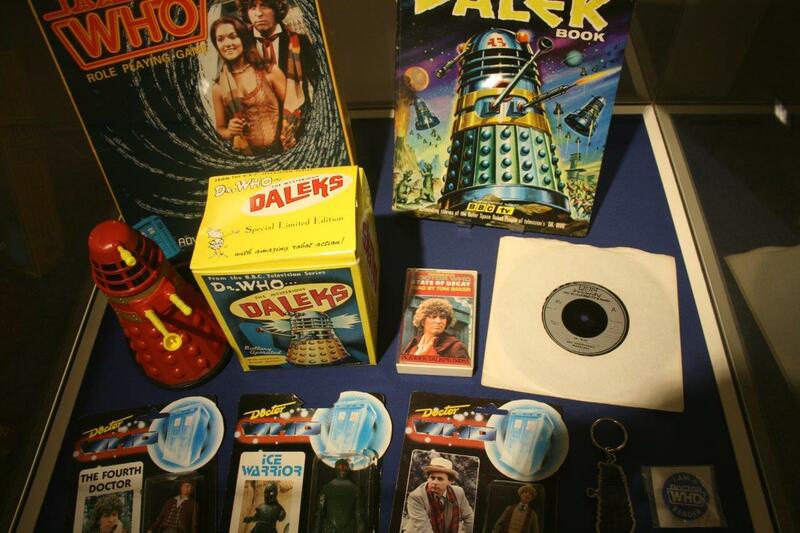 There are signed posters (the collector’s name is Susan, which caused much amusement) and there are books ancient and modern and there is even a copy of Dalek Attack, the 1992 Amiga game that I’ve never played, although there’s plenty of YouTube footage of the Doctor running through London streets zapping Ogrons and being most un-Doctorish (‘Day of the Daleks’ aside, anyway). 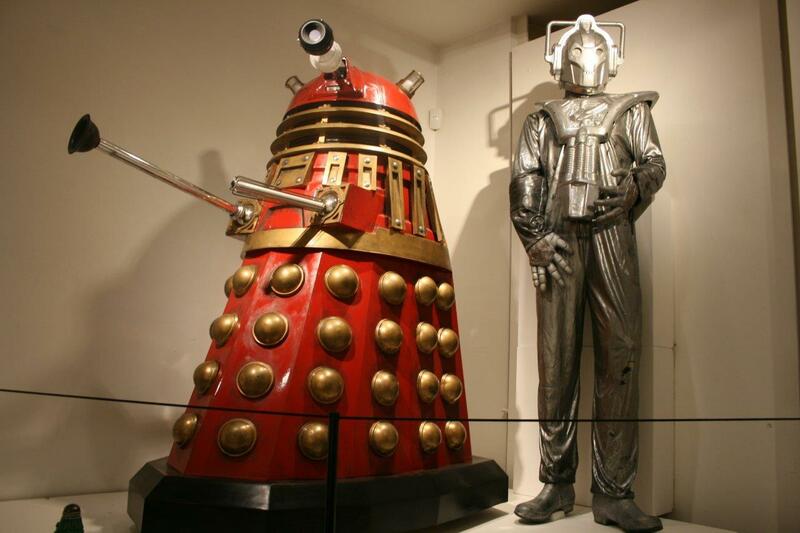 But the first thing that hits you – thankfully not literally – is the fan-made Dalek opposite the door. The Aylesbury branch of Oxfam has a collection of the Target novels, for the princely sum of £3.99 each, if you’re so inclined. I confess I am not, but fine if you have that sort of cash. You can’t see it very well but the action figures at the bottom of this case really are the pits. I’d call them a low point in the history of toy manufacturing but I think we reached that particular nadir when Character Options released their first five-inch figure collection last year, and we’ve already done all that. And in the middle of it – oh, frabjous day! It’s the ‘State of Decay’ audiobook recording I had when I was a kid. For all I know it’s the very same copy, which as far as I’m aware was given away by my parents years ago. But it probably isn’t. Yes, it is a TARDIS Easter Egg, and for a change we’re not talking about a scene of the Doctor having half a conversation while Martha whines about how the dinner’s on the table (and can we, at some point, please deal with the fact that every time we see Martha in 1969 she’s still wearing the same leather jacket and jeans, despite having lived there for months?). 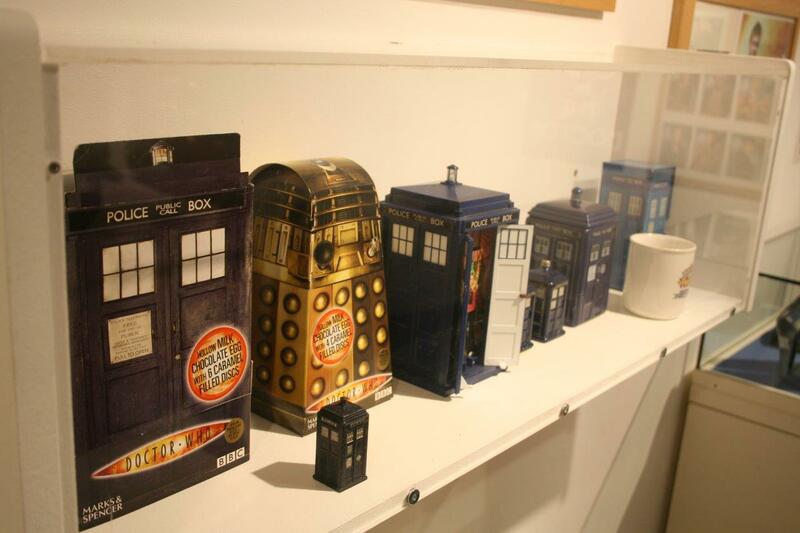 These TARDISes / TARDISi (you pick) dominate the right hand wall, and seem to lead the way naturally down to a full size one in the far corner. 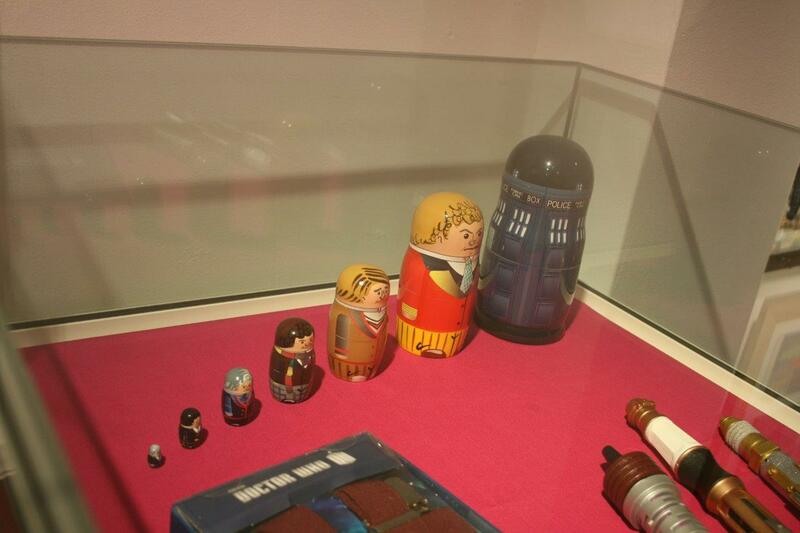 Directly opposite, we have the Russian dolls. I’m still not sure whether ordering Doctors 1-6 in this fashion is the right way round, or the wrong way round, or a combination of both. 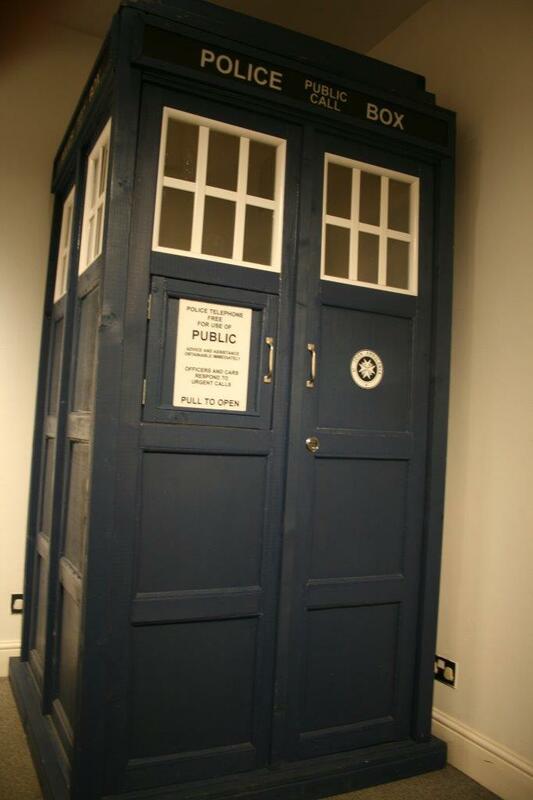 The TARDIS sits next to the dressing up box. In a rare break from tradition (at least for this new, non-anonymous version of the blog), I’m even including a picture of Edward. It was round about this time I got chatting to a visiting party, one of whom was picking ‘favourite Doctors’ from one of Susan’s signed wall charts. She’d tied Pertwee and Baker (I) for first, with Colin Baker coming second. I was telling her how nice it was to meet someone who likes the man’s TV work when Edward starting attacking the displays, so we made a run for it. Upstairs there is a drawer unit full of bug specimens and a display on beekeeping. “They could do a Doctor Who bee story,” Emily mused. “You know, something about the bees going home, but actually doing something with it. And the monsters are beekeepers with nothing under their hoods.” Which is sort of back in ‘Three Doctors’ territory, but (if you’ll forgive the obvious pun) I think it has wings. Certainly Daniel was hiding behind me when we got up here, although he has recently seen E.T., which may not have helped. I was still mulling this over in my head as we wandered back out into Aylesbury. The town centre itself is the usual collection of charity shops, pedestrianised precincts and indoor centres, but it does have a few decent-looking pubs to its name. It was market day, and the traders were out in force, peddling phone cases and mangoes and plastic toys. “Who’s that, Daddy?” asked Daniel as we passed by a statue overlooking the square. 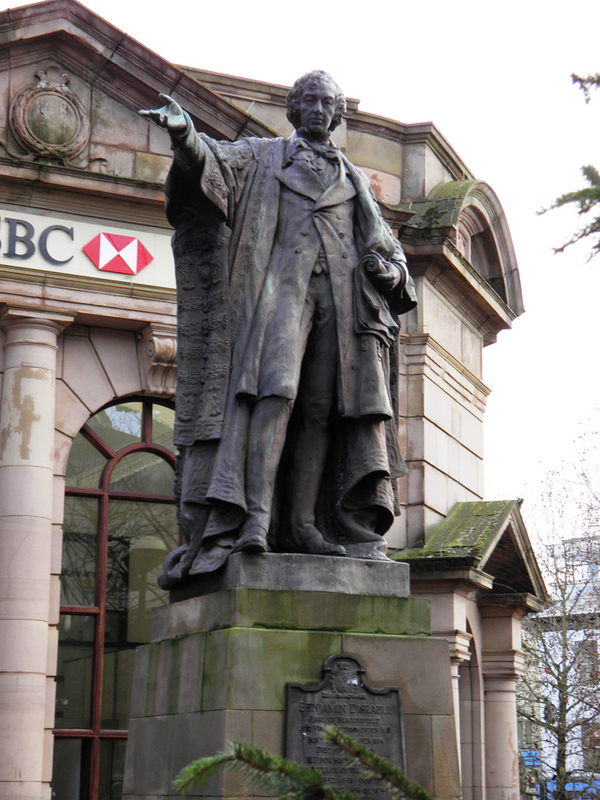 I looked on the plinth and explained that it was Benjamin Disraeli, a former chancellor and, eventually, Prime Minister. “It looks kind of like Jon Pertwee,” he said. And you know what? It does.